Our fare price varies depending on your distance from downtown Pittsburgh. We charge on a per person per trip basis. The farther your area is from downtown Pittsburgh the higher the price per person rate. ***Trips over 20 miles are subject to a $10 gas fee. Click here to use our handy calculator to determine your rate. These are some of our most commonly asked questions. Please call 412-563-2559 if you cannot find the answer to your question here. Can you bring you own alcohol/beverages? Yes! We do not supply alcohol/beverages or glassware but you are welcome to bring your own. You should bring with you what you can finish on your one way trip, our driver will handle your garbage. Because you may not get the same limo for your return trip we ask that you do not leave behind anything (coolers) that you want to get back. The price depends on your distance from downtown Pittsburgh. We charge on a per person per trip basis. The farther your area is from downtown Pittsburgh the higher the price per person rate. We charge $5, $8, or $10 per person depending which area you are getting picked up from and going to. Each trip is subject to a price minimum. The farther out from Pittsburgh the higher the minimum price. See pricing for details on what areas we cover and their price. See the minimum charge question below if your group does not have enough passengers to cover the minimum. This price does not include gratuity for the driver or the gas fee per vehicle. What does my $5, $8 or $10 per person cover? The fee covers one pickup and drop-off only (one-way). When you make a reservation we’ll ask you where you want to be picked up and where you want to be dropped off (subject to our covered territories). If you want to make a return trip then it will cost another $5, $8 or $10 per person and is subject to the minimum charge. You may schedule as many pickups and drop-offs as you would like throughout the evening. Each reservation scheduled is considered a one-way trip only. This price does not include gratuity for the driver or the gas fee per vehicle. What if we travel to from a lower priced area to a higher priced area or visa versa? When traveling to and from areas in different price ranges the higher price is always charged. in other words if you are traveling from a $5 per person area to a $10 per person area the trip fee will be $10 per person and subject to the higher priced areas minimum fee. How much is the gas fee? The gas fee is charged per vehicle per trip (Not Per Person). The fee is $2 per vehicle per trip. The gratuity is the amount that the customer feels the driver deserves. A typical gratuity would be 20% of the cost of the fare. What if our group does not have enough passengers to cover the minimum trip fair? There is no minimum number of people that you need to have, there is only a minimum price. For example, if you have 1-5 passengers in our $5 per person areas with a $25 minimum price, the price is $25 + gratuity + $2 gas fee . For every extra person beyond four, add $5 per person. In our $10 per person areas with a $50 minimum if you have 1-5 passengers the price is $50 + gratuity + $2 gas fee. For every extra person beyond five, add $10 per person. Each area may have a different price minimum. What happens if we have more than 10 passengers? If you have more than 10 passengers, we will send you multiple vehicles if we have the availability. There is no extra charge for the second vehicle unless your pickup or dropoff location has a stated multiple vehicle minimum. Please see List of Territories for all prices and vehicle minimums. However, there will be a charge of $25 if we send a second car to your group and there are 10 or fewer passengers. This is done to discourage groups from ordering extra vehicles that are not necessary. This applies to all multiple vehicle pickups. Because we have 10 passenger vehicles the cut off is always a multiple of 10. 10, 20, 30, 40, 50 passengers etc.. You must always cancel your extra vehicles if your group drops below a multiple of 10 or there will be a $25 charge for each extra vehicle not used. Yes, we will make one extra stop for a charge of $10. The extra stop must be pre-scheduled with a dispatcher and in the same community as the primary stop (as determined by Designated Driver.) If the second stop is not in the same community, it will be considered a separate trip and will be charged as such. All separate trips are subject to the per trip minimum charge. Our drivers are not able to set up additional pickups or set reservations. You must contact a dispatcher to do so. 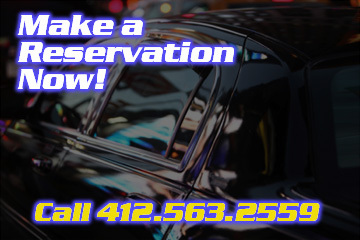 You make a reservation by calling 412-563-2559. You must make your reservation at least two hours in advance. We will need to know where and when you want to be picked up, where you want to go, and how many people are in your group. We will let you know whether we service your area and if we have vehicles available at that time. We recommend calling well before the time when you want to be picked up so that we can arrange to have a vehicle available for you. Feel free to also call at off hours (24/7) and leave a message on our answering machine if you want to make a reservation. We will get back to you. A voice message left on our machine is not considered a reservation. Reservations must be made with a dispatcher. We service all of Allegheny County and some areas in Mars and Washington County. Please see our pricing for a list of areas and their prices. Do you do one way trips? Yes, you can set up as many trips as you like throughout the evening, one , two, three, four etc. All trips for the evening need to be booked in advance with a dispatcher. You must cancel your pickup at least an hour in advance or your trip without incurring a fee. We ask as a courtesy to please give us as much notice as possible. If we arive at your location and the vehicle or vehicles are not needed there is a $25 fee and the unused vehicles will be redirected. This applies to all multiple vehicle pickups. Because we have 10 passenger vehicles the cut off is always a multiple of 10. 10, 20, 30, 40, 50 etc. You must always cancel your extra vehicles if your group drops below a multiple of 10 or there will be a $25 charge for each extra vehicle not used. During our off hours if you cannot reach a dispatcher please leave a message on our answering machine and we will get back to you. We return phone calls every day except Sunday. A message left on our machine is not considered a reservation. Reservations must always be made with a dispatcher. You can also check out our FAQ’s page for commonly asked questions.